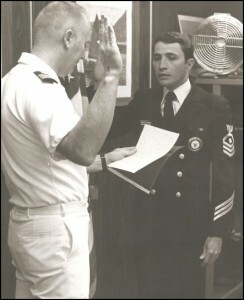 After the three years at sea I was up for shore duty and got Recruiting Duty just as I requested. But I ended up with Detroit, Michigan and not Omaha or somewhere closer. That was OK. 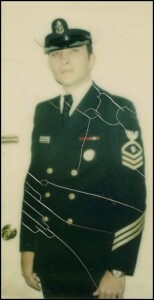 I was originally scheduled for a three year tour of shore duty with a rotation back to Sea. 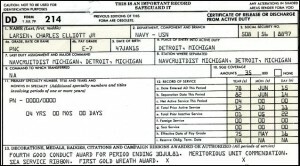 However, I received a one year extension, involuntary, because of funds shortage and since I decided to get out of the Navy at the end of my reenlistment they chose not to transfer me so I ended up staying in Detroit for almost 5 years. 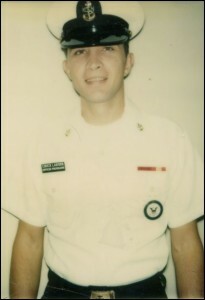 That long of a shore duty assignment for a regular Navy chief was unheard of, but things just happened for me that way. As I searched for pictures from this era I found that there were very few. I gradually became more and more disenfranchised with the Navy and more and more invested in my family life and it’s apparent from the lack of pictures from my five years at recruiting duty. 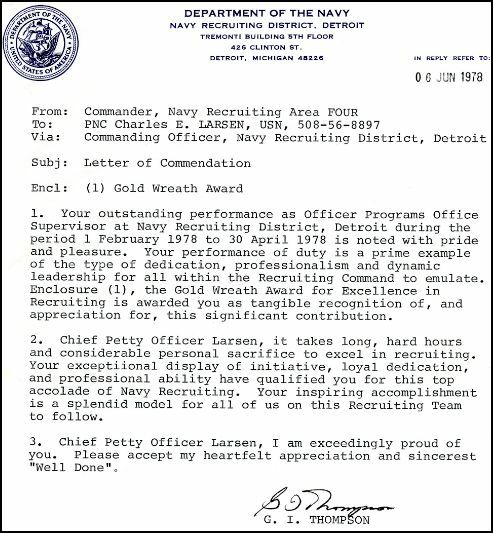 I was originally assigned as the Office Programs Office supervisor and in that capacity I supervised the work of about five enlisted members and civilian workers. During my five years there I went through quite a few people in a regular turnover routine. 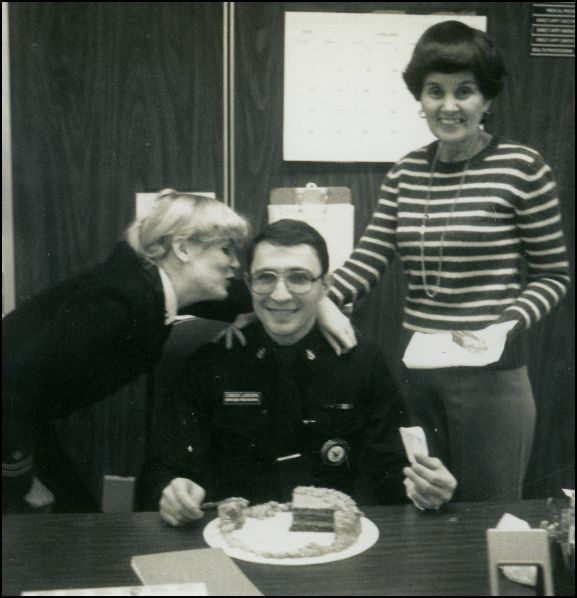 As the administrative office supervisor for Officer Programs I learned a lot about recruiting and had lots of contact with recruiters in the field who needed info on Officer Programs. 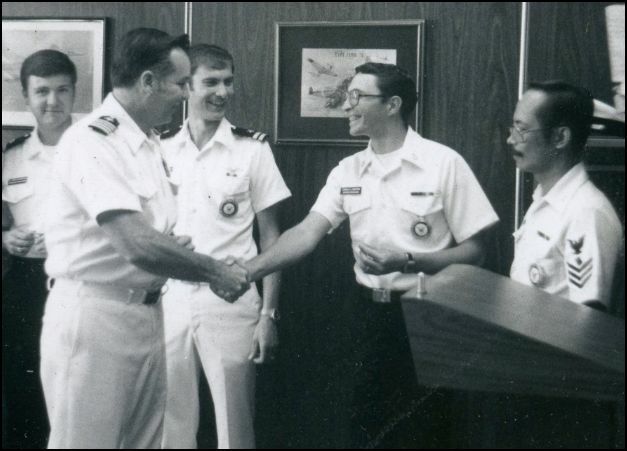 We handled every officer program from Health Care Professional programs (Drs, Nurses, etc) to Nuclear Submarine Officer and Pilot programs. I also had lots of exposure to the Chaplain Corps recruiting in those days as well. 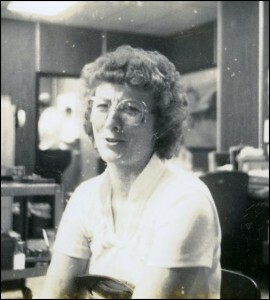 Mary Bell had been there for over 20 years and had handled all those non quota programs. She passed away from Lupus while I was there and I took over those duties. On my 31st Birthday, Mary bell and the Nurse Recruiter (I just can’t remember her name!) gave me a birthday cake at my desk. (Have you noticed the 80’s glasses? – Huge, huh?) It was during those years that I hired Linda Proszkowski. She was Leroy’s wife. I met Leroy in 1965 at Treasure Island on my first duty assignment. We were only together for a short time there but we became friends (Kind of). He even visited my home in Omaha on leave one time. But it’s a small world. He was from Detroit and to have his wife apply for a job with us was a real freak. Consider that there are millions of people in the Detroit metroplex and I get her. She worked at Opo (Officer Programs Office) for a couple years I believe. We never did rekindle a friendship. I reenlisted for my last time here in June 1978. I reenlisted for four years and that made sure I’d stay in after I became a Christian and set my sights on the Navy Chaplain Corps (Later Story). 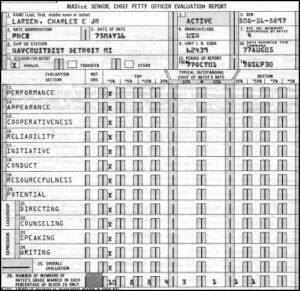 I did very well here as far as professional performance was concerned. 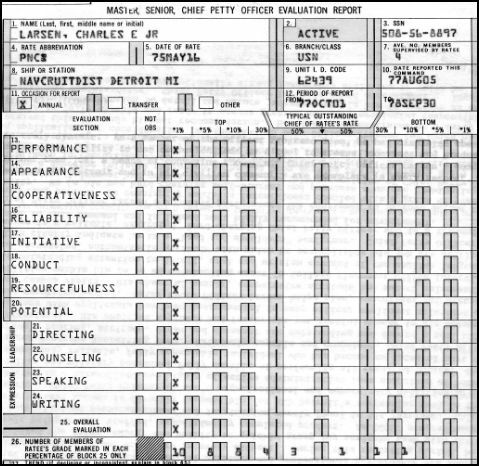 I was marked in the top 1% of all Navy Chiefs on several fitness evaluations, but as the years progressed here, those scores got worse. I think my nasty personality was catching up with me. 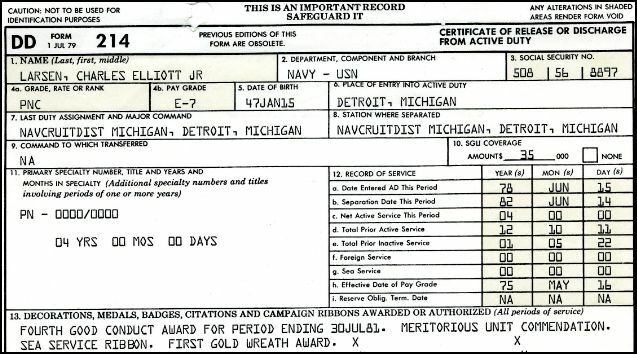 But I also won five gold wreath awards (See the round gold wreath on my uniform) and did so well in some areas that I was assigned as a field recruiter. For the last year or two I was assigned to an office in Roseville, Michigan about one mile from my house and recruited for Officer Programs from that office. I had become a serious Christian in 1978 and I changed radically. I don’t think those changes were as fully appreciated by the others. 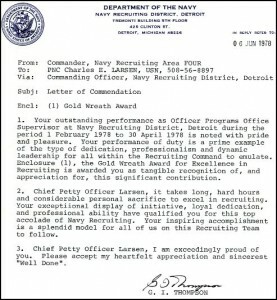 The truth about my assignment as a Navy Officer Recruiter in the Field was probably more along the lines that the Officers at the Recruiting Headquarters just wanted to get rid of me. It was at that time I was able to attend College almost full time while I recruited. I always made my quota also. After becoming serious about my faith, I set my sights on the Navy Chaplain Corp. I completed enough undergraduate hours to get accepted to Seminary and applied for the Chaplain Student program. I was turned down for it, probably for lots of reasons, but I liked to think it was because they were biased or prejudiced against me and my very conservative (Plymouth Brethren) endorsing agency. (More on this in the Navy Story entries later). After 16 years and 10 months of Active duty I decided to get out and go to seminary and apply for the program again while actually there. It was a hard decision to make because I was just a little over three years away from a 50% pay retirement. I would have drawn a monthly pay check for the rest of my life beginning at age 38. I think it was exceptionally frightening to Kathy. But she s tood behind me all the way. 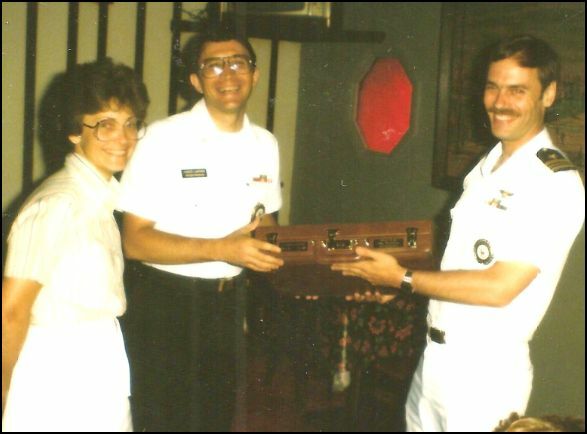 The Navy Recruiting staff gave us a farewell lunch and presented me with a beautiful leather brief case that I used all the way through Seminary and beyond. The departure was a bitter sweet event. So I accepted my last Honorable Discharge, reenlisted immediately in the Navy Reserves in Southfield, Michigan, attended one weekend drill, sold the house and packed up everything we owned in a six food trailer and moved to Dallas, Texas to attend Seminary.